This variety of jasper is mined in Mexico and sometimes referred to as orbicular rhyolite. Venus jasper gets its name from the planet Venus, which got its name from the Roman goddess of love and beauty. We love the blend of tan, brown and grey shades that makes this an ideal stone to mix with all metal finishes, so it's especially great in mixed-metal jewelry designs! Metaphysically, jasper is a stone of grounding, stability, strength, healing, comfort and security. You can see why some people call jasper the Supreme Nurturer. Venus Jasper 10mm round shades of brown and grey New! Venus Jasper 10 x 14mm oval shades of brown and grey New! Venus Jasper 12mm coin shades of brown and grey New! Venus Jasper 12mm square shades of brown and grey New! Venus Jasper 30 x 40mm oval shades of brown and grey New! 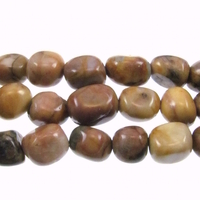 Venus Jasper 4mm round shades of brown and grey New! 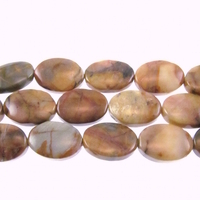 Venus Jasper 6mm round shades of brown and grey New! 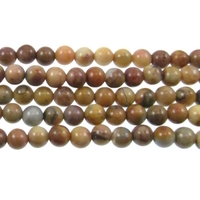 Venus Jasper 8mm round shades of brown and grey New! 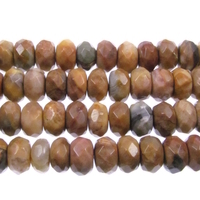 Venus Jasper 8mm faceted rondell shades of brown and grey New! Venus Jasper 8 x 10mm nugget shades of brown and grey New!